The week began badly for Turkmenistan with European aviation authorities announcing that the country’s national air carrier would no longer be permitted to fly in the EU. 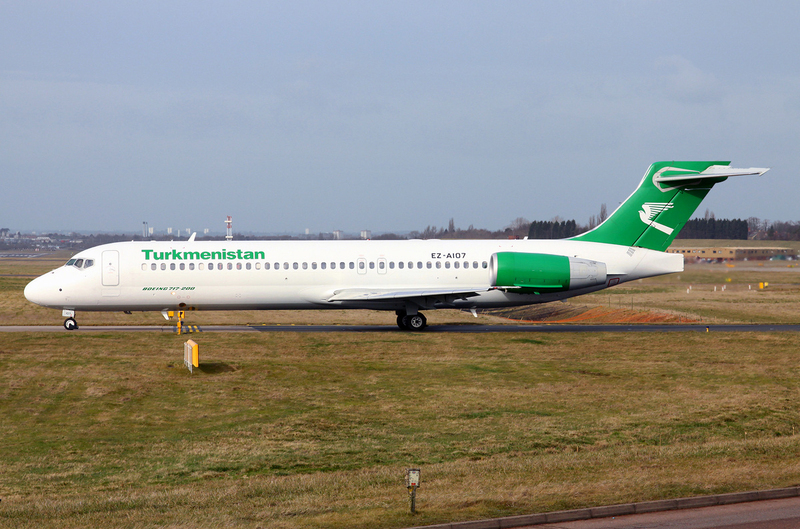 Britain's Civil Aviation Authority confirmed on February 4 that Turkmenistan Airlines flights to Birmingham and London have been cancelled. The state-owned airliner has an Ashgabat-Frankfurt route that will also be affected. The Ashgabat-Paris link has not been in service since December over what RFE/RL’s Turkmen service, Azatlyk, has reported are unpaid debts to Charles de Gaulle Airport. As if Turkmens wishing to travel abroad didn’t have it hard enough as it is. It is usually the regime that restricts people’s movements – young people are object of particular suspicion. As for foreigners, the visa regime makes getting into Turkmenistan an arduous challenge, so Ashgabat serves more often as a hub for those, to give one example, seeking a cheap route between Europe and the Sikh holy city of Amritsar in India. Those travelers are important sources of foreign currency. It is unclear how long flights will be suspended as the European Aviation Safety Agency, or EASA, investigates whether the airliner is in compliance with flight safety regulations. It is not even known yet what instigated this suspension. But it would be no surprise to learn this is all to do with unpaid bills, since that is now par for the course in Turkmen state companies’ dealings with foreign partners. A Belarusian company called Belgorkhimprom and state-owned chemicals enterprise Turkmenkhimya are still feuding over a potash plant opened in March 2017 to much fanfare. Garlyk is still only operating at a fraction of its intended capacity. Sources familiar with the situation have told Eurasianet that Turkmenkhimya still owes Belgorkhimprom at least $150 million for work done on carrying out the project. While some advance the case that Turkmenistan is still solvent, the bulk of the evidence points in the opposite direction. In the latest belt-tightening measure, the president signed off on a decision to terminate state funding for research institutions within the next three years. In an especially cynical piece of theater designed to impart this worrying policy with the appearance of legitimacy, a conference of scholars was convened in a scene that brought to mind the image of turkeys celebrating Thanksgiving. The Chronicles of Turkmenistan has warned that more is awaiting, with elementary schools and kindergartens next in line for cuts. Undaunted by reality, the government claimed the economy expanded by 6.2 percent in 2018, just a smidgen down from the 6.5 percent reported in 2017. As if to tacitly address unstated concerns, the official announcement offered a $11.2 billion figure for foreign export earnings. That is not a bad figure, all things being equal, but skepticism is warranted. The vast majority of foreign exchange earnings come from China, which is currently the sole purchaser of Turkmenistan’s natural gas. Data shared by the Economist Intelligence Unit's Samten Bhutia show overall exports to China were only $6.6 billion in 2017. Turkey came in second place with $381 million. While the China-Central Asia gas pipeline did hit maximum capacity in late 2018 – around 160 million cubic meters per day – the vast majority of additional supply over the last year seems to have come courtesy of Kazakhstan and Uzbekistan. Turkmenistan made some progress last year with its plans to sell electricity to Afghanistan, but as a report issued this week by the Caspian Policy Center argues, major hurdles loom ahead. All the same, the government confidently predicts that gross domestic product growth will bounce back in 2019, to 6.3 percent, and then rise inexorably to 8.2 percent by 2025. And how do they intend to pull this off? By investing a whopping 229 billion manat – $63 billion at the official exchange rate but just over $11 billion at the black-market rate – over the next seven years. According to announcements made during the February 1 Cabinet meeting, one-tenth of this amount be spent in the coming year on a series of infrastructure projects. Later increases in spending will be enabled by the government’s move to privatize the transportation sector, or so the authorities claim. Turkmenistan has made similar pledges about the cotton industry, but a February 1 resolution makes clear that the sector will still be dominated by the state. It is not even certain Turkmenistan’s notion of privatization accords with how that concept is understood elsewhere in the world. The links between the nominally private firm that was awarded a colossal highway contract and the state appear to run deep. The cost-cutting and privatization is occurring alongside streamlining of the state apparatus. A number of ministries, government institutes and state bodies were consolidated, while a raft of new appointments were made, at the Cabinet meeting. The energy sector saw the most turnover – the Netherlands-based Alternative News of Turkmenistan, or ANT, had predicted such changes just days earlier – but new heads were also appointed to the State Committee for Water Resources, the Agriculture Ministry, the Industry and Communication Ministry, the Textile Industry Ministry and at the state insurance agency, whose former head was reportedly sacked for corruption. A generous evaluation of this process might attribute it to a desire to assemble a more nimble government, but the more credible explanation is that the authorities are looking every which way for people to fire. President Gurbanguly Berdymukhamedov barely makes a speech these days without boasting about what strides are being made by private business. But stories of regular businessmen facing repeated harassment and demands for bribes – such as the one detailed in an ANT report detailing the fate of Balkanabad entrepreneur Antaloy Chakanov, who was jailed in late 2017 for 17 years after refusing to pay a $40,000 kickback – make a mockery of such pronouncements. The only things that survive the chop are the things that happen to interest Berdymukhamedov personally. So while research across the board is being defunded, Turkmenistan is getting a brand new Institute of Medical Plants. Berdymukhamedov, a dentist by training, happens to have written numerous colorful books on the subject. Reprising his trademark fiddling-while-burning routine, Berdymukhamedov took several hours this week for a jaunt. His bicycle ride around Ashgabat and a visit to an equine center occupied around one-quarter of the running time of the evening news bulletin on February 3. The cycle trip was ostensibly intended to showcase the fact that “millions” of trees have been planted around the capital. (Incidentally, the state news agency described Berdymukhamedov as engaging in cyclocross, an arduous off-road discipline, when what he was actually doing was coasting along a highway on what was very obviously an electric-powered bicycle). Official accounts of Berdymukhamedov’s frolic with one of the horses, Ruhubelent, was pure propagandistic derangement.